What Makes the Past, Present & Future Ring Truly Romantic? Whether it’s for an engagement or wedding, a promise ring or even an anniversary ring, you want a ring that will capture the strength and beauty of your love. When it comes selecting the symbol of your devotion, there’s truly no better choice than the past, present and future ring. A past, present and future ring is an elegant three-stone ring where each stone represents a piece of your relationship. One stone for a couple’s history, one for their current commitment, and one for their excitement of the many years to come. While a three-stone ring is fairly common, not everyone knows the symbolism behind the setting. With this knowledge, you will not only find a ring that speaks to your past, present and future, but also to your one-of-a-kind union; the ultimate romantic gesture. 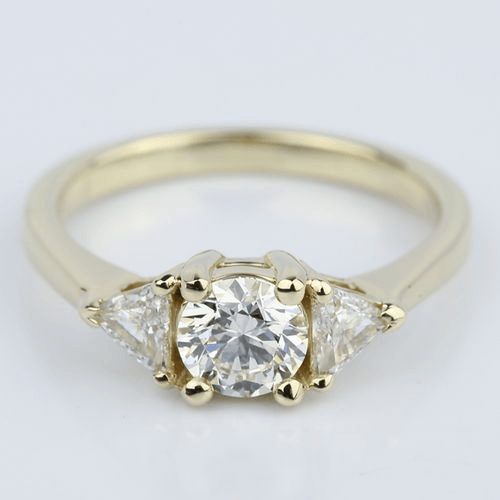 As mentioned before, the three-stone setting is rather common. 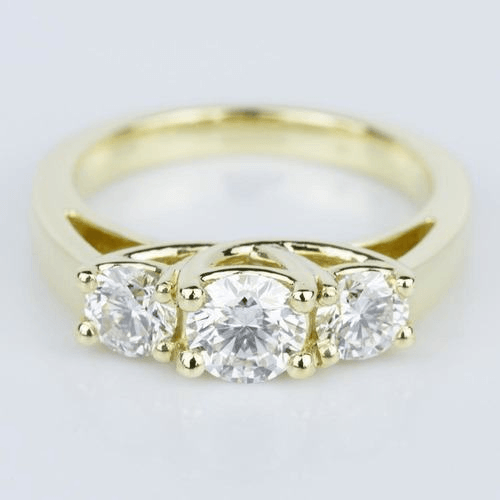 However, you can easily make yours as unique as your love by picking stones that are different carat sizes or even diamond shapes; maybe without any diamonds at all. Gemstones add a personal touch to any ring; represent your beloved’s birth month, the month you both met or even show off their favorite color. Your romantic ring can be styled however you wish: bold, simple, traditional or completely out of the ordinary, but make sure it represents you. Diamonds are often the star of the three-stone ring. Many couples choose diamonds to represent the time trilogy of the relationship due to their beauty and rarity. Diamonds are also considered the ultimate representation of forever because of their natural durability and longevity. But diamonds aren’t everyone’s best friend. 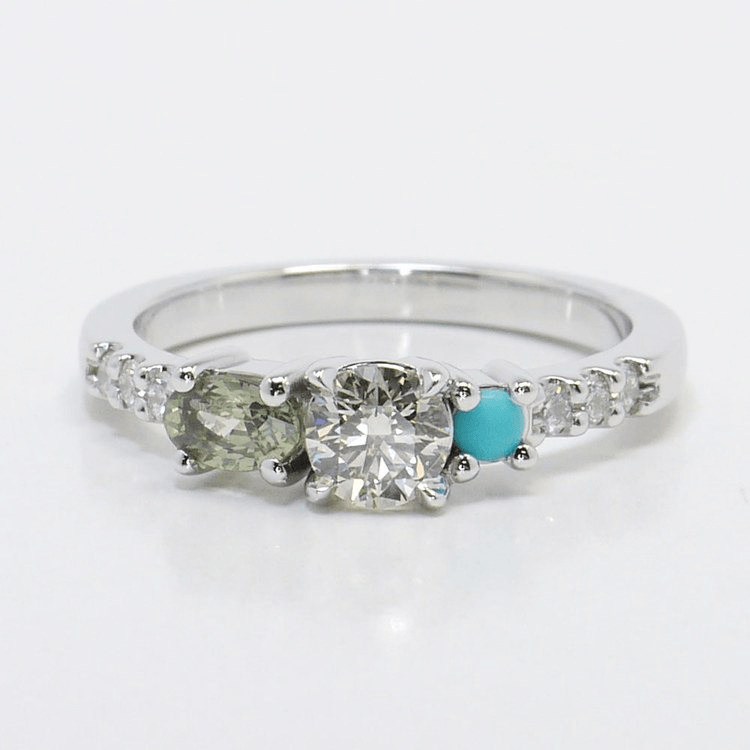 A trio of gemstones can also makes a stunning three-stone ring. The choice is yours. When selecting gemstones for a three-stone sentiment, couples may choose birthstones as part of the design. Include the birthstones for each partner and set a diamond in the center of the colorful duo for a meaningful and personalized piece. Incorporate a new baby’s birthstone for a statement of a new family. Couples also can choose stones that represent their favorite colors, or even a favorite team’s colors. Remember, the ring design should represent your relationship, so don’t be afraid get creative. 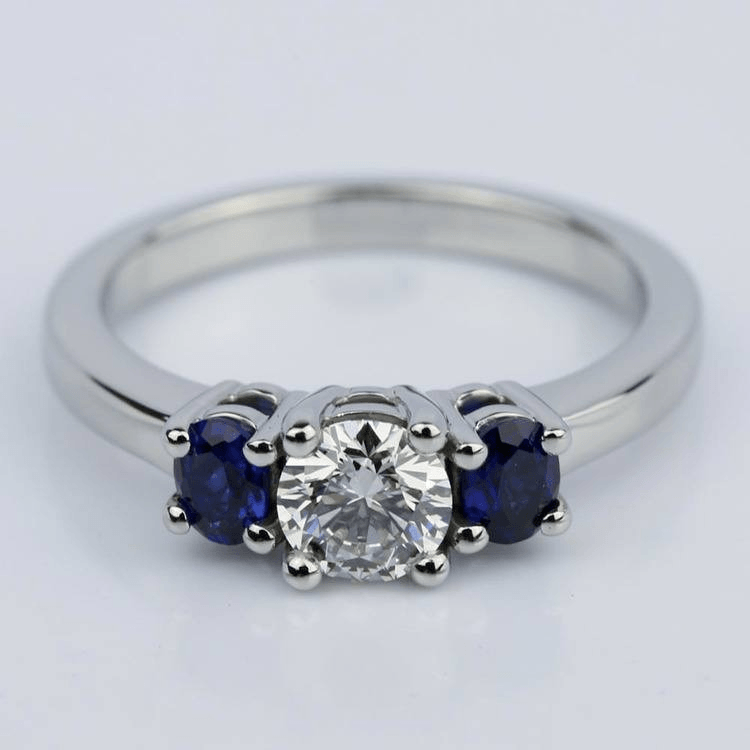 Keep in mind that the three stones you select for your ring don’t have to be of equal weight or proportion. Choose varying size stones for visual interest, or pair different diamond shapes together for an eye-catching arrangement. Try adding petite geometric trillion cut stones alongside a traditional round center stone, or pair round stones with a fancy pear or marquise cut diamonds. Play with different shapes and sizes to create a design that perfectly matches your partner’s personality. You also may choose to stair-step your stones: each stone gradually lessens in size giving the appearance of graduated steps. The stair-step effect can be achieved with color as well; this works well with diamonds. Choose a color gradient within the trio for a subtle transition. 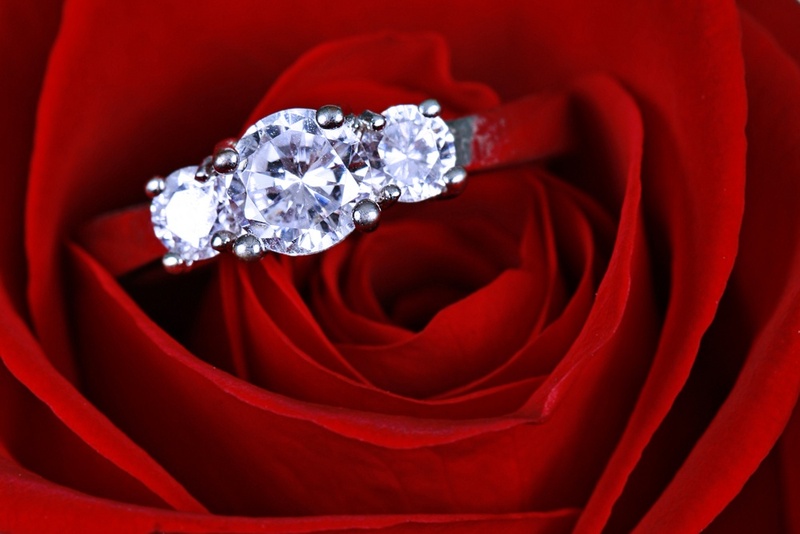 You may need to work closely with a jeweler to design the look you want. The band for your three-stone ring acts as the backdrop for your stones. If you choose large gemstones or diamonds, select a band that’s wide enough to secure them. Larger carats may look out-of-place against a thinner band, and smaller stones may be buried in a thick band. Your ring’s band is another place to add a personal touch. Engraved messages can be added to the inside, or outside, of the band. Many people take this opportunity to integrate personalized elements of your past, present and future. If the two of you met at university, include the crest into the ring; or if you bonded over a love of music, scrolled music notes can work their way around the band for a creative motif. While three-stone rings are traditionally a trio of similarly-sized diamonds, there are no design rules for such a sentimental ring. Mix in gemstones, birthstones, different sizes and shapes, or even unique elements within the band to create a ring that represents your relationship’s past, present and future.